106 pages | 1 B/W Illus. 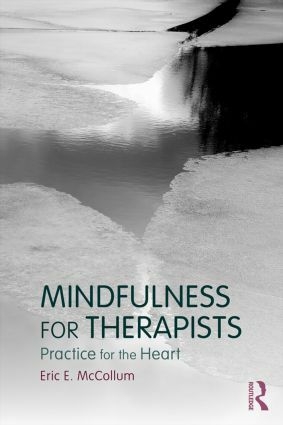 Mindfulness for Therapists: Practice for the Heart encourages therapists to embrace mindfulness practice to create presence and depth in their work with clients. Mindfulness helps therapists cultivate compassion, relieve stress, and weather the often emotionally difficult work of providing therapy. In addition, the therapist's own meditation practice is a necessary foundation for teaching mindfulness to clients. Through a variety of exercises and stories from his own clinical experience, McCollum helps therapists understand the usefulness of mindfulness, and develop their own practice. "For therapists and their clients, cultivating the capacity for mindfulness and compassion is at the core of successful psychotherapy. As Eric McCollum points out, therapists cannot facilitate this unless they have an ‘inside-out’ experience and understanding. This wonderfully clear and wise book guides therapists on how to incorporate mindfulness into their own path in a way that can bring inner transformation, and healing to the hearts of all those whom they touch." --Tara Brach, PhD, Author of Radical Acceptance and True Refuge. Eric E. McCollum, PhD, is Professor and Program Director of the Marriage and Family Therapy Master's Program at Virginia Tech, where he teaches mindfulness meditation to all students in the Marriage and Family Therapy training program. He has practiced psychotherapy for nearly 40 years and has practiced meditation in the Buddhist vipassana tradition for more than 30 years.